Some customers have several office branches and hope to establish VoIP connections between them. There are several methods to do that. 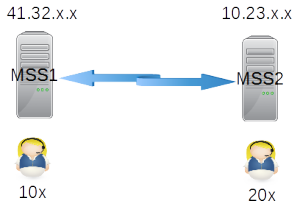 Here we give an example to describe how to establish voip connections between two MSSes with SIP trunk feature. The network topology is simple. There are two office branches. Please refer to below figure. Before we setup voip network, it is better to assign extension numbers. Different office numbers will effect how to configure call routing in both MSSes. In above figure, we can see the extensions in office 1 are 1xx, and extension numbers in office 2 are 2xx. Both MSSes are configured with public IP address. If your MSS is behind NAT or router and you want to provide connection for outsides users, please refer to another document firstly. Now we give detail configurations for it. In below configurations, items should be kept their default values if we don’t configure them obviously. Please click menu “dial plan – analyzed called number” , then add a record for routing 2xx to such SIP trunk. It is almost same with MSS1. Please click menu “data – SIP trunk” to add a record. Please click menu “dial plan – analyzed called number” for routing calls to above SIP trunk.